This is a dish designed to use some of those leftovers from Easter dinner. 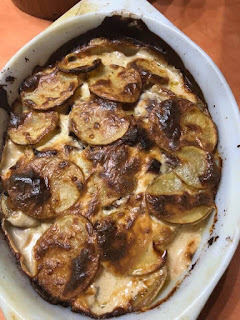 It is a creamy and delicious and a meal all in itself. With cooking spray, spray a 2 qt. casserole dish. Lay 1/3 of the potatoes into the dish. Cover with 1/2 the ham and 1/2 the asparagus. In a saucepan melt the butter, then whip in the flour. Allow to bubble. Whip in milk and cream and bring to a boil. Boil one minute, stirring constantly. Remove from heat and pour 1/3 of the mixture over the potatoes in the casserole dish. Top with another 1/3 of the potatoes and remaining ham and onion. Top with another 1/3 of the sauce. Cover with remaining potatoes. Pour remaining sauce on top and sprinkle with salt, pepper, and a few bits of butter. Cover and bake at 375 for 30 minutes. Uncover and bake an additional 60-70 minutes. These are a delicious touch of springtime! The small tarts are enough for one or could be shared by two. You will need 4 small tart pans. You could make this as one large tart and just cut into slices if you do not have the small pans. In a mixer bowl beat together the butter, sugar, vanilla and salt until smooth. Add the egg yolk, mixing until well incorporated. Stir in flour, or mix in slowly. It will seem crumbly at first but will eventually come together. Divide into 4 pieces. Line tart pans bottoms with parchment paper, then spray with pan spray. On a floured surface roll each section of dough into a 7"-8" circle. Transfer to tart pan. Trim edges. Place tarts into the refrigerator for 20 minutes. 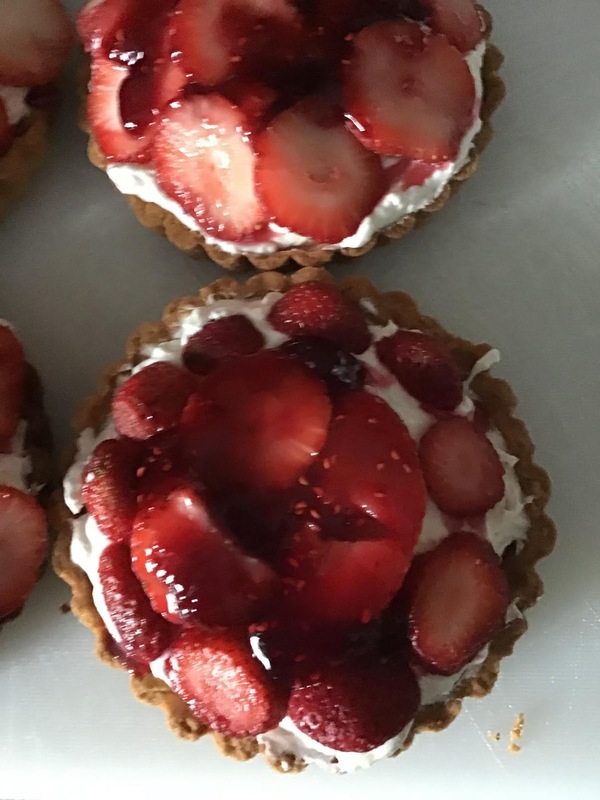 Bake tarts in a 375 degree oven for 15 minutes or until lightly browned. Cool before removing from the tart pans. Beat cream cheese, sugar, vanilla and lemon juice until well mixed and creamy. Slowly beat in cream. If the mixture is still very stiff, add an additional bit of cream. Put cream cheese mixture into cooled tart shells. Put all ingredients into a saucepan and bring to a boil. Turn down to a simmer and continue cooking for 5 minutes. Cool completely. Spoon topping onto the top of the charts. 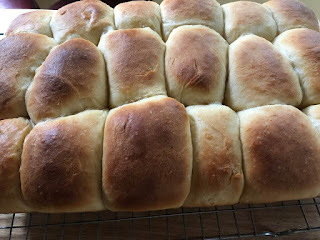 These are a great roll to go along with an Easter ham dinner. If you have any left they would make perfect rolls for sliders! Mix flour, yeast and salt in a mixer bowl. Stir together the pineapple juice, honey or sugar, 6T. butter, and milk. Heat to lukewarm-don't worry if it looks curdled. Slowly add this mixture to the flour in the mixing bowl. Beat on medium speed with the dough hook for 5 minutes. Or knead by hand. The dough will come together but still be a bit sticky. Put in a buttered bowl and cover. Put in a warm place to rise for 1 1/2 hours. The dough should double in size. 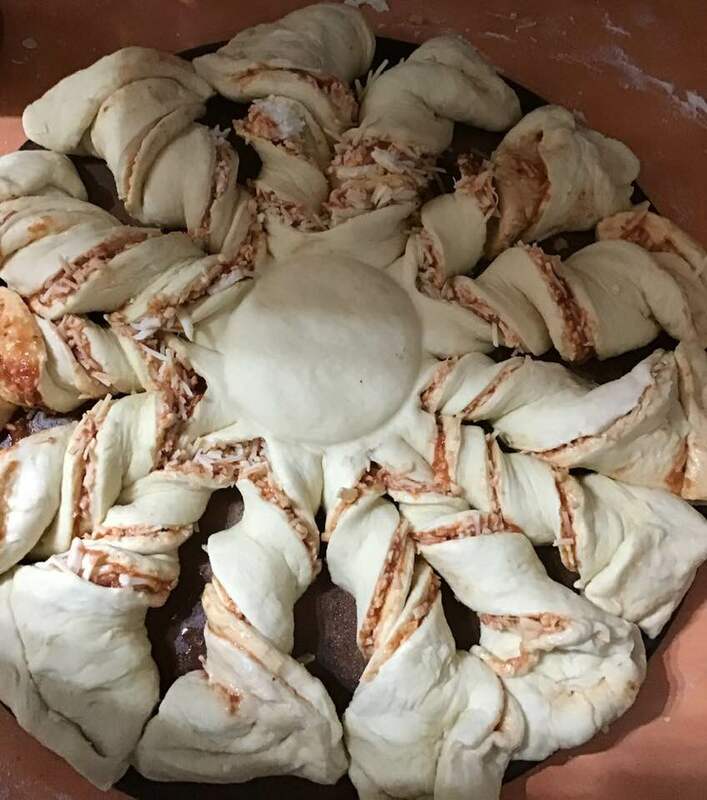 Take dough out of bowl and divide into 18 pieces. Roll each piece into a ball. Place balls in a 13 x 9 inch baking dish that has been sprayed with cooking spray. Cover and let rise for another 1 1/2 hours. Brush tops with some of the 3 T. butter. Bake at 375 degrees for 20-25 minutes. 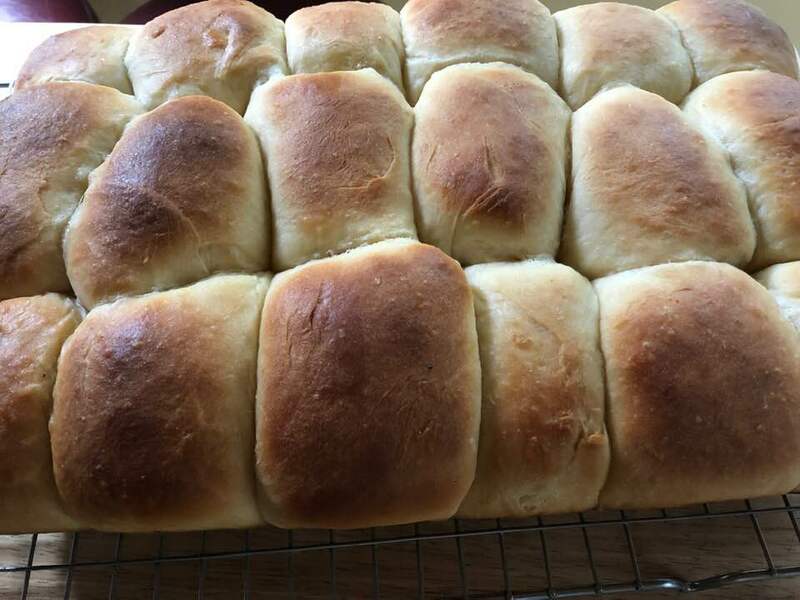 Brush with butter again when rolls come out of oven. Allow to cool at least 10 minutes in the pan before removing. 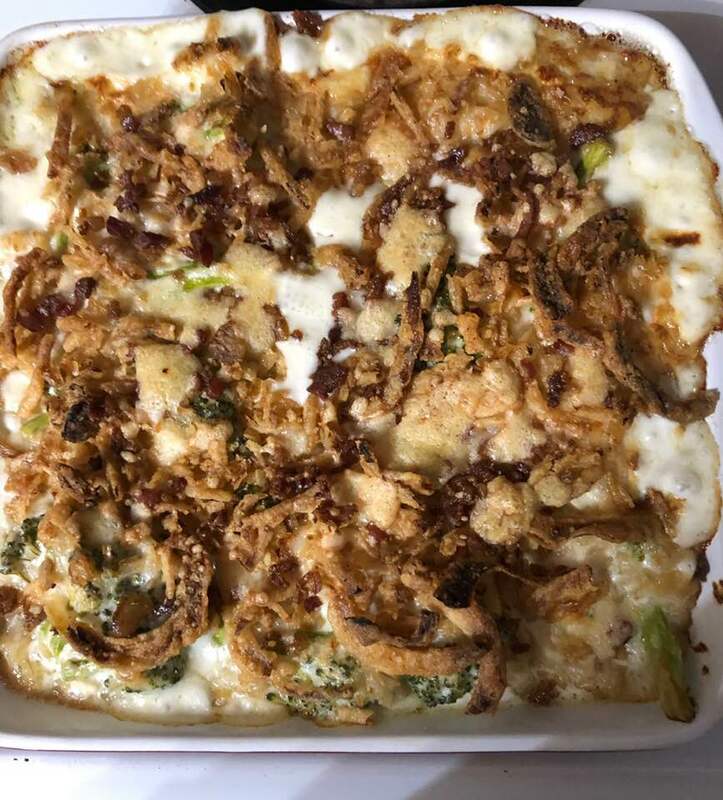 This casserole has a nice creamy interior with a crunchy cheese-bacon-onion topping. You can make the casserole even easier and quicker to put together by using Uncle Ben's microwave brown rice packets. Either way this is one comfort food dish. Heat oil in a skillet. Add chicken and broccoli and saute until chicken is no longer pink and broccoli is tender crisp. Mix 1/3 c. flour and 2/3 c. half and half. Pour into chicken mixture. Add remaining milk and half and half. Cook for about 5 minutes. Stir in 1 3/4 c. of the cheese and rice. Mix well and allow to continue cooking on medium heat until the cheese melts. Pour the mixture into a 8" x 8" baking dish. Sprinkle on the french fried onions, bacon bits and remaining 1/4 c. cheese. Put dish into a 375 degree oven and cook 15 minutes. This is a kind of half pita sandwich/half gyro with lots of veggies and fried spiced garbanzo beans. Top it with an easily made tzakiki sauce and it becomes more like a gyro. Anyway you eat it, it makes a quick healthy dinner. In a frying pan put all the above ingredients. Saute on medium high heat for 15 minutes. You want the beans to get toasted and the vegetables soft cooked. Put all above ingredients into a food processor and process until smooth. 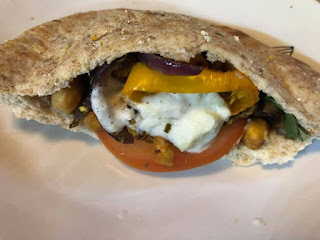 Put filling into pitas and top with sauce. 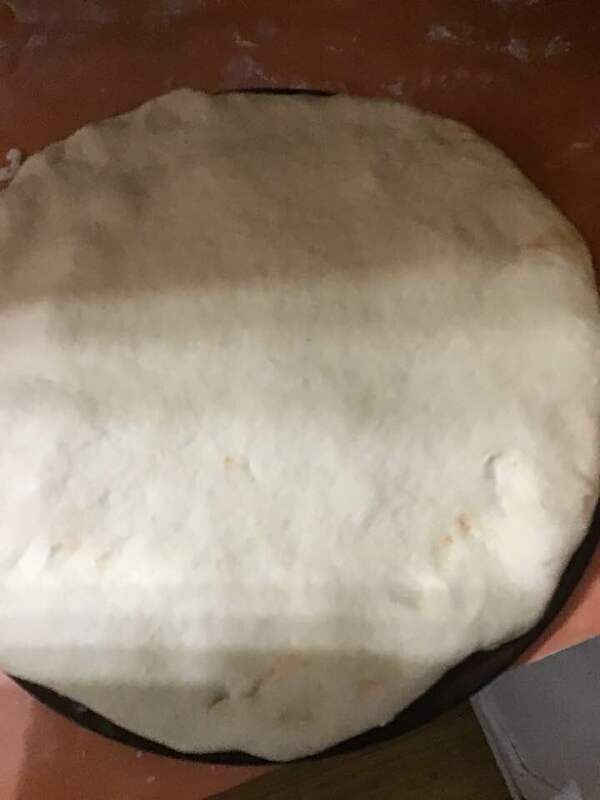 You can preheat the pitas by wrapping them in foil and putting into a 350 degree oven for 10 minutes. If liked you and also put sliced tomatoes, cucumber slices, spinach or lettuce into the pitas. These are a delicious alternative to a meat burger. 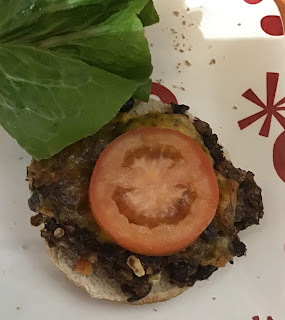 You can serve it up as a traditional burger or put on some salsa, avocado, cilantro, lettuce and tomato for a Mexican burger. Put all ingredients into a food processor and process til well mixed. Form into 6 patties and place on a parchment sheet covered baking tray. Bake at 450 for 10 minutes. Flip and cook an additional 5-8 minutes. Leftovers can be frozen or reheated in the microwave. 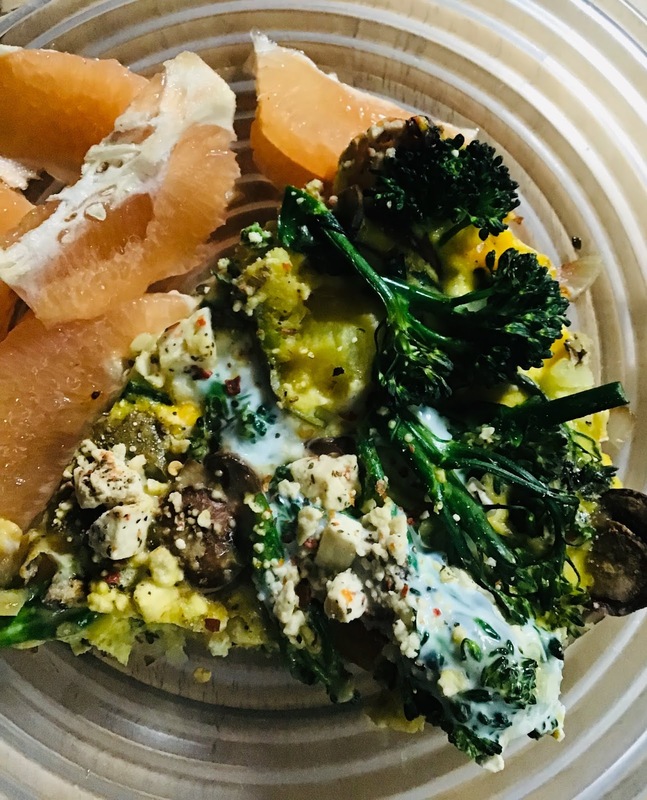 This frittata makes a great dinner with leftovers for breakfast, lunch or dinner the next day. Make sure you have a frying pan that can go into the oven for this recipe. In an ovenproof fry pan put 1 T. Olive oil. Add mushrooms, shallots, red pepper, broccoli and zucchini. Sauté on medium heat for 5 minutes. Prick the potato with a fork and put in a microwave for 4 minutes. Dice potato and add to other vegetables. Beat eggs together well in a bowl. Pour over vegetables and cook on medium heat, covered, for 4 to 5 minutes. Uncover and place in the oven on broil for 4 minutes. This is a delightful salad-good for a light lunch or as an accompaniment to a nice gyro. 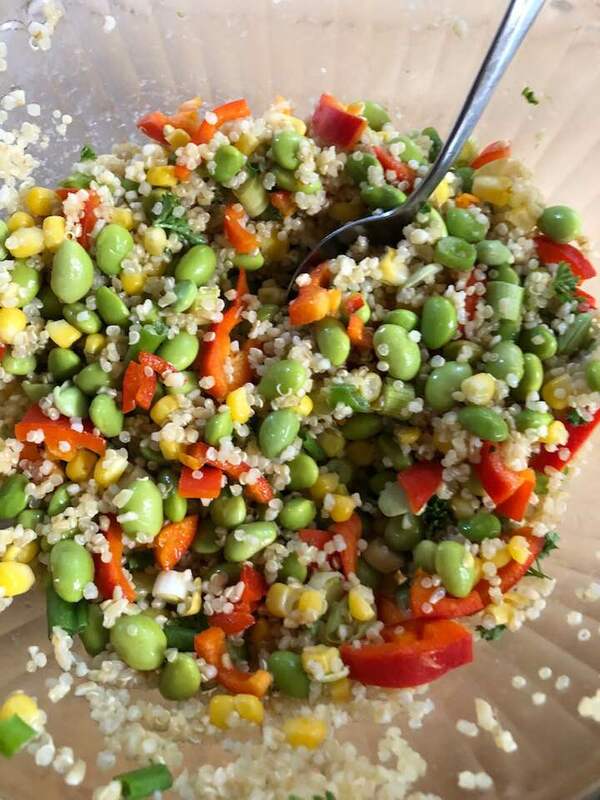 Thanks to the quinoa it is full of protein and nutrition. Boil the edamame and corn, then drain. Cool. Combine the edamame, corn, quinoa, onions, pepper, and parsley. Whisk together the oil, lemon, garlic and thyme. Pour over the quinoa mixture and stir well. We have been eating lots of vegetables the last few weeks and taking a bit of a break from meat. This casserole is perfect just as it is and I promise you won’t even miss the meat. It is super good with a spoonful of guacamole on top. In a saucepan with a small amount of oil or vegetable broth saute all the vegetables for 5 minutes. Stir in beans. Put about 1 c. Of this mixture on the bottom of a 9 x 9 in. Baking dish. 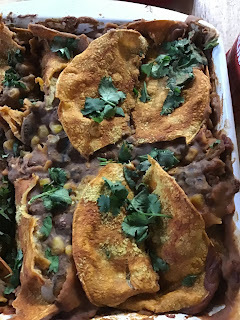 Take 4 corn tortillas and dip into the enchilada sauce in a bowl, then place on top of vegetable mixture. Sprinkle with yeast or cheese. Repeat the layers. 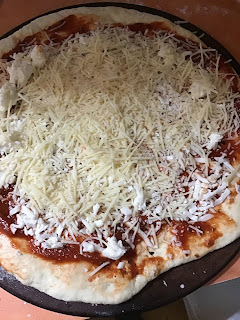 Finish with cheese on top. Bake at 375 for 30 minutes. This dish reminds me of fall. But served with a nice salmon patty it makes a great spring dinner too. If you are trying to eat more plant based or vegan this can also be a delicious main course. Cut squash in half, scoop out seeds. Place the squash, cut side down, in a baking dish with about 1/2 c. water. Cover with foil and bake at 375 for about 30 minutes. Check for tenderness-you want it fork tender. If it is still hard, bake longer. Put 1 c. broth and quinoa in a saucepan. Bring to a boil. Cover and simmer for 15 minutes. In a frying pan put the remaining 1/2 c. broth and onion and garlic. Bring broth to a boil, turn down to simmer for 5 minutes. Add mushrooms and cook for 5 minutes. Add spinach and cook for an additional 3-4 minutes. Stir in spices and nutritional yeast (if desired.) Sit in quinoa. In baking dish turn squash to cut side up. Spoon quinoa mixture on top of the squash. Return to the oven and bake for 15 minutes. This is a great dinner with a side salad. Tear off the strips and dip into some warm pizza or marinara sauce. Put water into a large bowl. Add yeast and whisk until yeast is dissolved. Add oil, sugar and salt. Whisk until well combined. Stir in enough flour to form a dough you can easily handle without it being too sticky. Put flour on a countertop and knead 4-5 minutes. Divide in half. Roll ou one half to a circle large enough to fit on a pizza pan or stone. Place on stone. 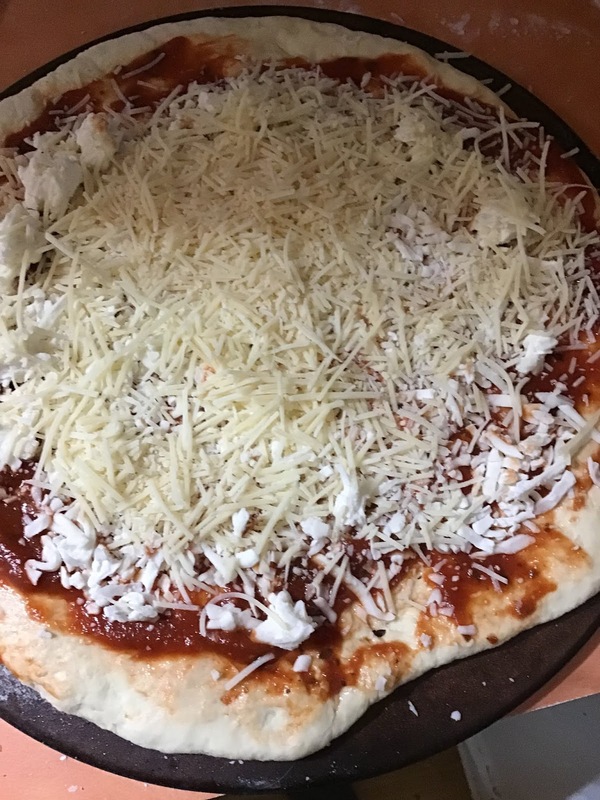 Spread sauce then cheese on top. Roll out the other half of the dough and place on top of first one. Pinch edges to seal. Place a small glass in the center. With a knife cut into 1/4 s from the edge of the glass out. Then cut each 1/4 into three slices from the glass out. Take each strip and twist around three times. Put into a 400 degree oven and bake 20 minutes. Serve with warm sauce. Topping. The small tarts are just right for one big or two smaller servings. It could also make one regular size tart. The crust is a sweet cook type crust. 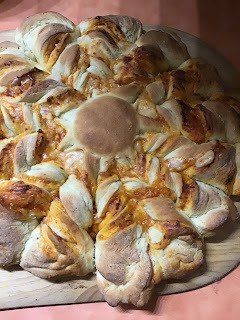 The crust recipe is from King Arthur Flour. Line tart pans with parchment paper. Spray with cooking spray. Beat butter, sugar, vanilla and salt on a medium low speed with a mixer. Beat until smooth. Add the egg yolk. Stir in flour until dough comes together. Roll out dough on a lightly floured surface. It should be about 1/4 inch thick. 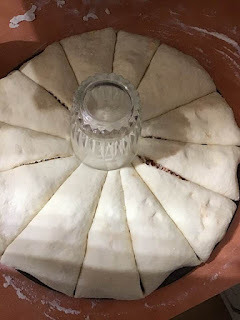 Transfer dough to tart pans. Trim the edges even with the top of the tart pan. Press dough lightly into the sides of the tart pan. Bake tarts at 375 degrees for 30 minutes. Beat sugar, vanilla and cream cheese. Stir in cool whip. Put into cooled tarts and top with sliced strawberries. If desired heat a little strawberry jam and spoon on top of strawberries. 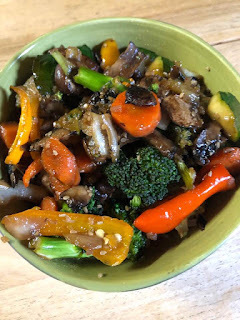 This a quick nutritious dinner chock full of both vegetables and flavor. Great for a quick dinner. Put all vegetables into a nonstick pan. 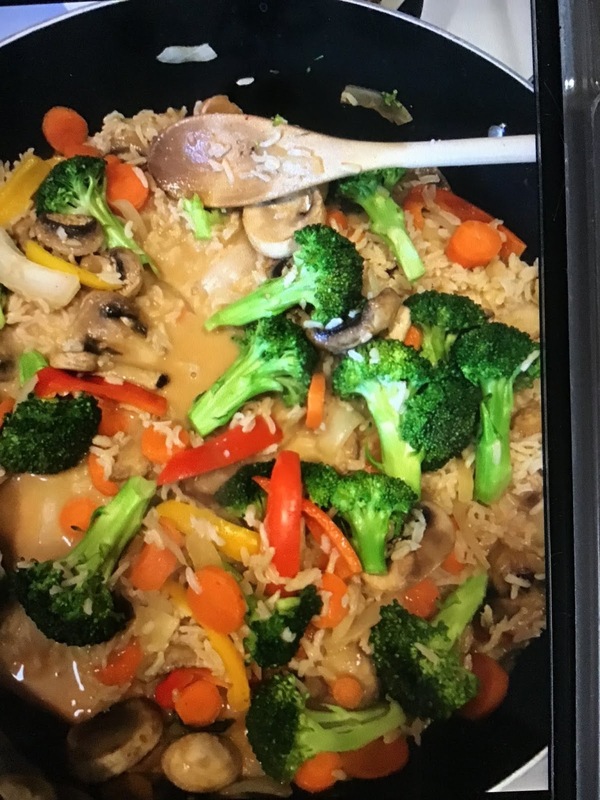 Cook over medium heat yntil broccoli and carrot are crisp cooked. Add in milk, syrup and curry paste. Cook until sauce thickens. 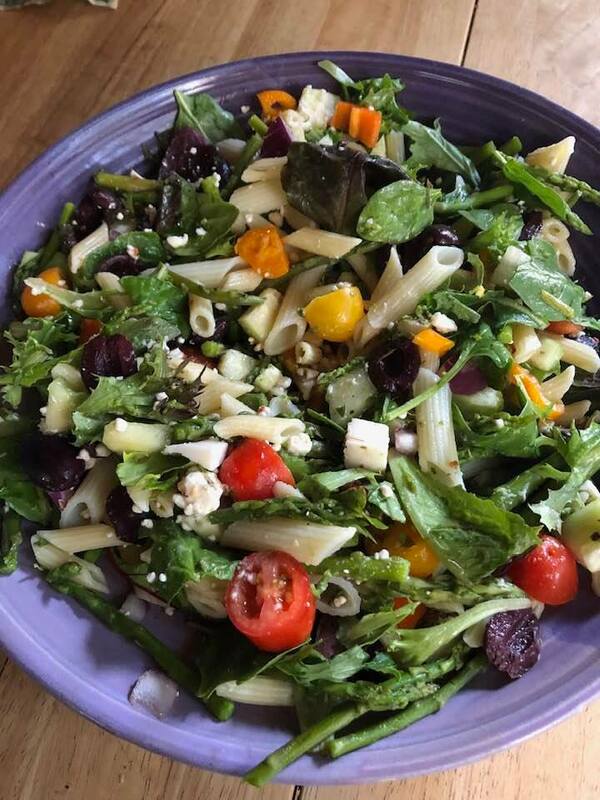 When spring arrives, it starts becoming salad time for dinner in our house. Tonight on the menu is a nice light salad with just enough ingredients to make it filling and full of flavor. If you want to add protein you can always add some grilled shrimp or chicken. If you don't like goat cheese, feta cheese will also work nicely. Toss together all ingredients with dressing and serve. This is a delightful dinner with lots of flavor and nutrition. 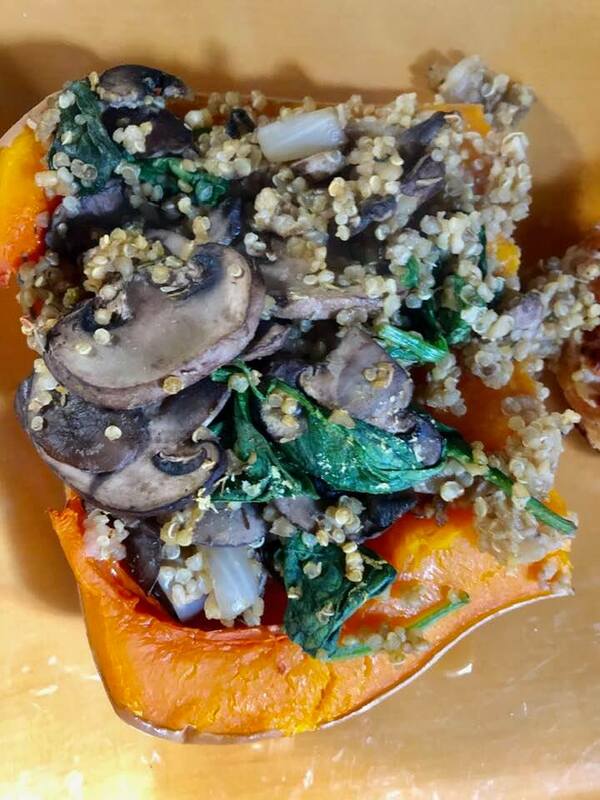 If you are looking for a tasty vegetarian dinner you won't be disappointed in this one. Put oil in a large frying pan. Add all vegetables and cook until crisp tender. Add teriyaki sauce. Put together in a saucepan. Bring to a boil, cover and simmer for 45-50 minutes. 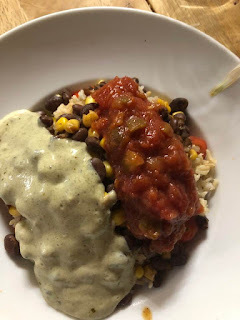 This is a simple vegetarian dinner, complete for a cilantro spiked sour cream that is made from tofu. It is filling and leftovers make a great lunch. Try it for a meatless Monday meal. Put these ingredients into a saucepan and bring to a simmer. Cook 1 c. brown rice with 2 c. water for 50 minutes. Place rice over raw vegetables in bowls. Top with bean-corn mixture. This time of year who isn't thing of warm tropical breezes, palm trees, and warm weather? 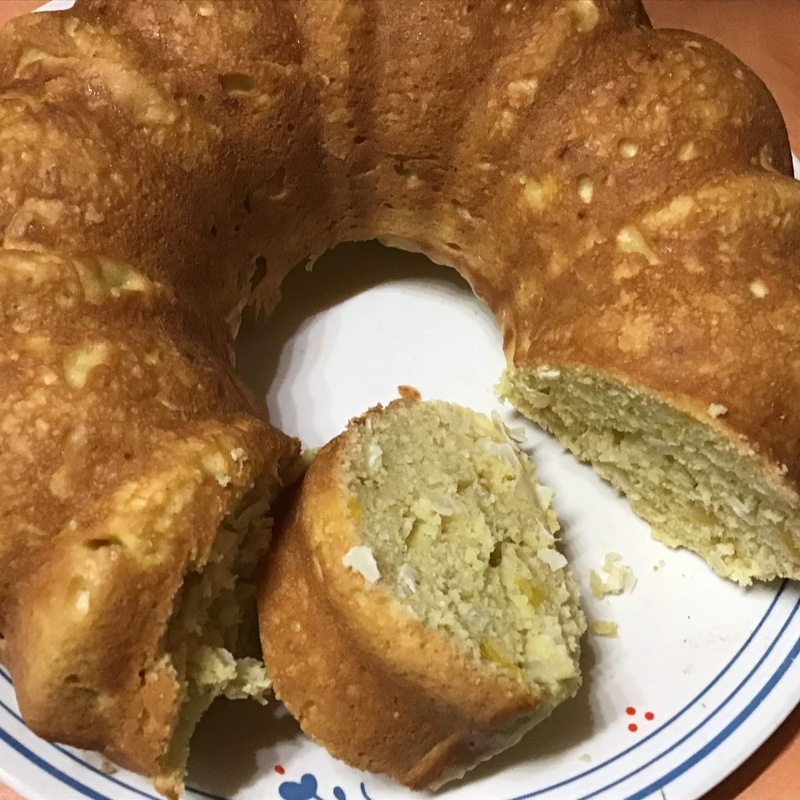 This bundt cake is part of a series of bundt cake recipes offered by a bundt cake baking club. 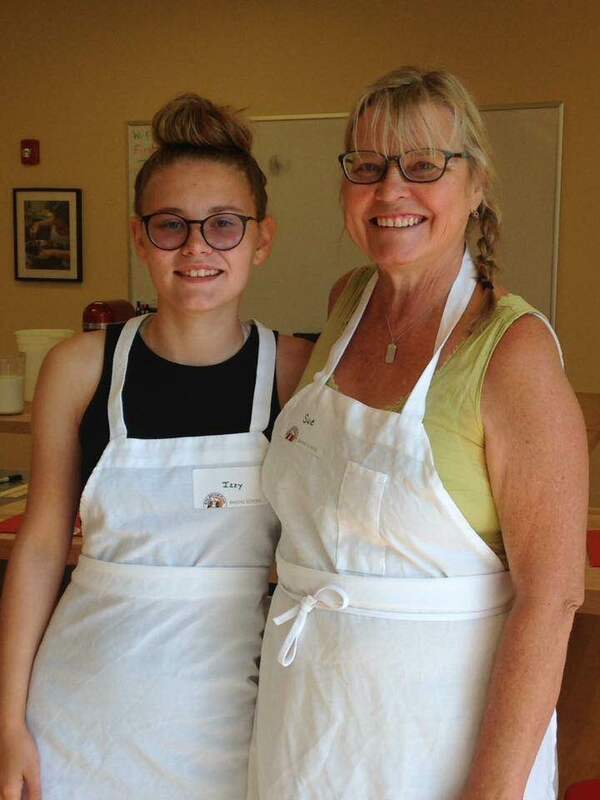 I found one of their members at: janesadventuresindinner.com. This is a great little way of bringing the tropics home to your kitchen. In your mixer bowl, using the paddle, mix the mango and sugar until well combined. Add coconut flavoring, vanilla, coconut milk and eggs. Beat well. Add the flour, ginger, and baking powder. Mix batter until it is smooth. Spray a bundt pan with cooking spray. Put batter evenly into the pan and bake at 350 degrees for 50 minutes. Recently I had to bring a dish to thank our classified staff for all their hard work. 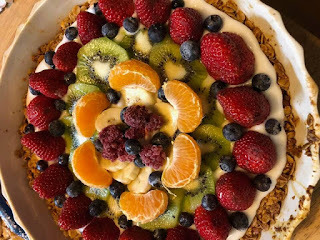 This dish was a perfect breakfast treat. It is healthy and beautiful. Mix oats, nuts, butter, and honey in a bowl. Spray a tart pan with cooking spray. Press oat mixture into pan. Bake at 325 for about 25 minutes, or until golden brown. Allow to cool. These are a nice breakfast, or a treat with a cup of coffee or tea. The dough can be quite thick if you choose to use yogurt, and you may need to add a little milk to just thin it a bit. Mix the wet ingredients into the dry ingredients. Spray a muffin try with cooking spray and fill the cups 2/3 full. On the top of each muffin sprinkle a little brown sugar and cinnamon. 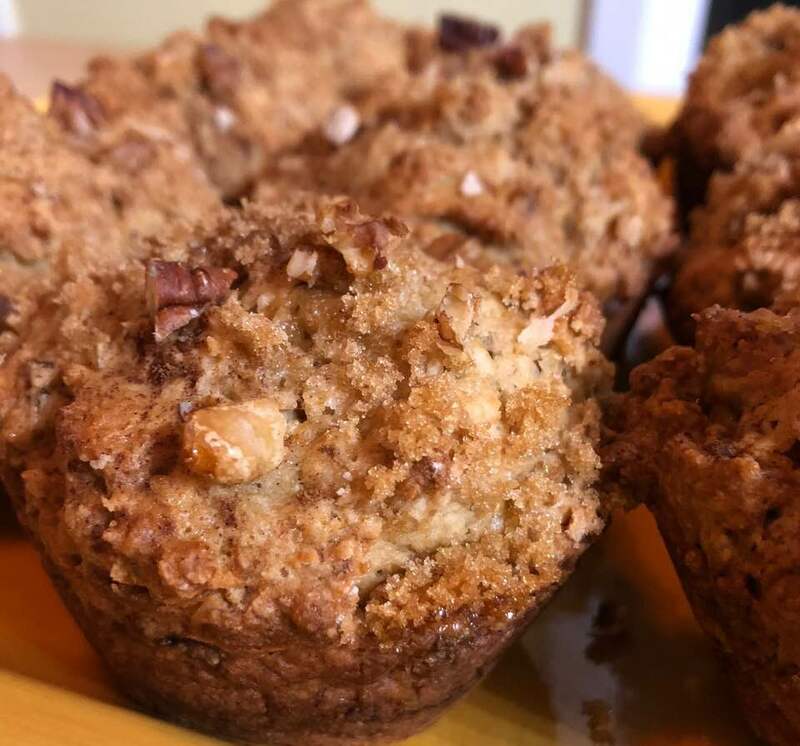 Put a few chopped nuts on top of each muffin. Bake at 400 for 15 minutes. Sometimes it is nice to just have a dinner without meat. This one is certainly filling and tasty. Be sure to give yourself and hour and a half for it to bake. Prep is super easy. Remove from oven. 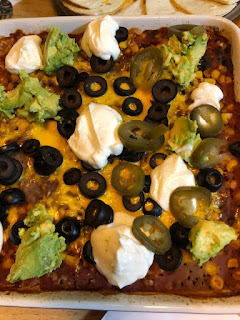 Sprinkle with Cilantro, sour cream, jalapenos and avocado as desired.